What do we mean by 'ecotourism'? Ecotourism Australia defines ecotourism as "ecologically sustainable tourism with a primary focus on experiencing natural areas that fosters environmental and cultural understanding, appreciation and conservation". 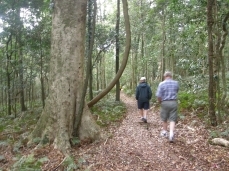 All our tours have achieved advanced eco-accreditation with Ecotourism Australia. Summing up the responsibilities of ecotour operators, in an interesting interview with the International Ecotourism Club, Martha Honey says ecotourism "should 1) benefit conservation, 2) respect basic rights and benefit host communities, and 3) be educational as well as enjoyable for the traveller". 1) Involves travel to natural destinations. Our tours all go to natural habitats, including rainforest, eucalypt forest, outback communities and undeveloped coastlines. 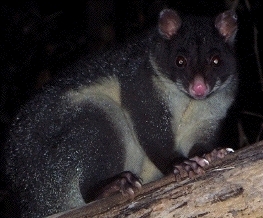 We also visit some semi-natural areas such as rainforest restoration sites, water treatment plants which retain or restore natural vegetation and support a good variety of bird life, creeks in partially-cleared areas that still support platypus, wildlife parks with good reputation for education and conservation breeding, and an artificial cave which now hosts the world's largest colony of glow-worms (and takes visitor pressure off over-exploited natural colonies). We try to do more than just minimise impact, but also to enhance habitat for wildlife. We received a grant in 2007 from the former Beaudesert Shire Council to separate our horse-grazing area from our rainforest regeneration area and set up experimental plots to monitor the restoration and changes in wildlife and plants within. This study will continue for many years, as will clearing of weeds from part of the area. We are also conserving existing native vegetation on the property and restoring damaged habitat (in addition to the regeneration area mentioned above) by removing weeds and planting local species, with continued monitoring of fauna and flora. Proprietor Dr Ronda Green is a research ecologist who has studied birds and other animals in the field for many years, including human impacts, and has had piratical experience of tour-leading and field excursions over many years. She has also conducted extensive literature research plus various interviews with tour operators and conservation managers for the Sustainable Tourism Cooperative Research Centre, and with co-author Karen Higginbottom published a report on 'Negative Effects of Wildlife Tourism on Wildlife'. On behalf of Wildlife Tourism Australia she also contributed to the wildlife guidelines for Ecotourism Australia's eco-accreditation process and has led workshops leading to WTA's policy statement on the feeding of wildlife. Although it is probably impossible to have zero impact, this background has enabled us to reduce the impacts of our own tours on the wildlife we view. We try to leave the animals doing whatever they were doing when we first saw them (with some obvious exceptions - such as when we are waiting for fruitbats to fly out on their nightly foraging sessions). We take notice of research that has shown the kinds of things that disturb not only the animals that we are watching but other shy and less conspicuous animals we may be affecting without noticing. to be content with not knowing a bird's identity rather than risk disturbing it at its nest or inducing a sleeping diurnal bird to fly at night. We also take care not to disturb the vegetation as we walk - although it is sometimes tempting to have more of a wilderness feeling by going off the track, we do not wish to lead increasing numbers of walkers to where they will be compacting soil and trampling vegetation. When we first started our tours we measured soil compaction with a potentiometer in two parts of the forest at home, one where we were to take up to 7 guests walking once a week, and one left untouched. There was a significant difference in soil compaction when measured again just six weeks later. Our house and our wildlife ecology centre run almost entirely on solar power via photovoltaic cells (solar panels), deep cycle batteries, and inverters for items we can't run directly on 12 volts (we do have a small backup diesel generator for situations when we have had a dew days of overcast weather). We bought our home property in 1980 and have never been connected to the main electricity supply, but have used solar power throughout. Batteries in our torches (flash lights), laptop computers and other gear are all charged from solar panels. Our garden lights and electric fence are also solar-powered: even our outdoor Christmas tree lights. We would love to drive a solar-powered bus, but of curse this is not possible. We use an ethanol/petrol mixture in our main tour vehicle. We are aware that in some countries this brings its own environmental problems, but in Australia there does not appear to be further clearing of forests to produce ethanol, and if the use of this renewable source of energy can play a role in reducing the usage of the world's fossil fuel supplies it seems at present the better choice. We are exploring the possibility of making biodiesel for the 4WD vehicle. Any plastic bags that are unavoidable with our food purchases are recycled as litter bags on our picnics. We try to buy locally-produced items where possible, to reduce the fossil fuel usage in importing them from afar. No one can care about things they don't know the existence of, and a lot of our effort, both with our guests and with local residents, goes into showing them the great diversity of wildlife we share this planet with, and what fascinating creatures are included. This is one of the major reasons we started an ecotour company, and why we are devoting so much time and money to our Scenic Rim Wildlife Ecology Centre and nature trails. We have also provided displays of local plants and their use by Aboriginal people at the Rathdowney Visitor Information Centre. During our tours we point out some of the conservation problems, and we are also active in local community efforts to combat some of these problems. For instance Ronda has started, and is the acting chair of, the Scenic Rim group of the Wildlife Preservation Society of Queensland, and has run a second Wildlife Expo in Beaudesert in 2010 (having successfully run the first plus a number of wildlife workshops in 2008) as well as various other events and displays. Our website pages are designed to provide information on wildlife and their ecology and habitats, plus information on sustainable tourism, wildlife conservation and animal welfare, for guests before they arrive, and for all other interested readers. We also try to spread the word about sustainable tourism, especially regarding wildlife (at which a representative of Ecotourism also presented a talk). Locally, we ran a workshop on wildlife tourism in Beaudesert in 2008 and displays on sustainable wildlife tourism in Rotary's Eco Expo in 2007 and 2008, . 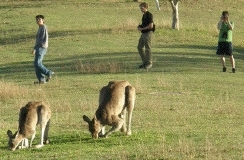 Nationally, Ronda has conducted research and published reports on impacts of wildlife tourism for the Sustainable Tourism CRC, is vice-chair of Wildlife Tourism Australia (which promotes wildlife tourism that supports wildlife conservation), and contributed to the development of guidelines for wildlife in Ecotourism Australia's Eco-certification process. She has also presented various talks at national conferences (see publications and talks by Ronda Green). Internationally, Ronda joined the Ecotourism Australia team at ITB (International Tourism Bourse), the world's biggest travel show, in Berlin in 2006 to help promote eco-accreditation and has joined online discussions such as those at Planeta, including discussions on definitions and on wildlife tourism and conservation. We feel that although all accreditation schemes and definitions of 'ecotourism' and 'sustainable' have their problems, if no one strives towards the ideals or discusses how to refine one's attempts it will be too easy for businesses to use the words loosely for promotional purposes with no real attempt at environmental protection or the other facets of ecotourism. We strive always to continue our own education in fauna, flora, conservation issues and all other relevant topics, and ways of imparting these without 'preaching' or 'school-room' approaches. Several publications by Ronda Green are available at the National Library in Canberra or available through the Sustainable Tourism CRC. The fees we pay yearly and per person per entry to National Parks in both Queensland and New South Wales presumably go into funds for maintenance of our protected areas. We also donate to various wildlife conservation causes such as WWF, and assist in fund-raising for local wildlife conservation bodies (especially the Wildlife Preservation Society of Queensland). 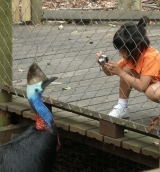 The entry fees to the David Fleay Wildlife Park and other conservation-oriented places that we visit also provide funds for conservation, and we let our guests know they can assist conservation breeding programs by a donation to the Wildlife Park. We would like to do more on this in the future, but have not been altogether idle in this field. We employ one young local on a casual basis for both guiding and landscaping, and another for book-keeping, and hope to expand on this in the future. We also quite frequently take local residents on free tours when we have room in the tour vehicle (they just provide their own lunches). We buy fuel in local regions rather than fill up completely before leaving the city, and patronise good little local restaurants and pubs, in addition to local small-business accommodation venues on our extended tours. We understand that some aspects of conservation of wildlife sometimes run counter to the immediate interests of some local landowners, and have participated in public and other discussions that we hope will lead towards workable solutions. On behalf of Wildlife Tourism Australia and the Logan and Albert Conservation Association, we ran a workshop in 2008 on wildlife on private lands, including a discussion on environmentally sound ways of controlling problem wildlife as well as how to attract, keep and identify wildlife on farming land. Biodiversity on private lands is a very big issue that needs far more discussion if we are to preserve biodiversity as well as agricultural income in the district, as the national parks and other protected areas will never be sufficient for all species. We would like to be able to take more excursions across privately-owned land that retains native ecosystems, to take pressure off national parks, and pay landowners for this privilege, but public liability issues remain to be sorted out. It appears that it is uncomplicated if we do not pay the landowner and simply pay extra for their insurance, but if we wish to pay them (which only seems fair, and will also provide a reward for keeping intact habitats on their land), they will incur a greater burden of insurance premiums that we can't directly assist with. We have in the past taken guests to the Aboriginal-owned Yugambeh-language property at Mount Barney, where we have more recently conducted a fauna survey for Yugambeh Land Enterprises Limited, and intend doing so again in the future, as well as the Yugambeh Museum in Beenleigh. We have also quite frequently taken guests to the Minjungbal Aboriginal Culture Centre in Tweed Heads as an optional extra to our 3-day wildlife tour or part of a customised tour - like the Yugambeh Museum, this is run by local Aboriginals, so our guests have the opportunity to meet and talk with them to gain insights into past and present culture, and the entry fee and any purchases at the shop helps to assist the community. Regrettably, the Aboriginal peoples of our own home valley are long gone. From conversations with members of the Mununjali clan (Beaudesert area) there were no massacres here as in some other local areas, but the people were badly afflicted with European diseases, and those who survived scattered widely and lost touch with their culture. Other areas we travel do have records of previous culture as well as Indigenous families still living in the region. Without breaching etiquette (there are things we have been told by Indigenous people that we do not pass on to others) we introduce our tour guests to some of the local Indigenous legends, important places, and use of local plants, and have provided a display of the last-named at the Rathdowney Information Centre. When requested, we have introduced special Indigenous components to our tours, visiting the Minjungbal Aboriginal Culture Centre, or a property owned by local Aboriginal groups of the Yugambeh language group at Mt Barney. We would also be very happy to take our guests to the Yugambeh Museum at Beenleigh. Ronda and Darren have also conducted a fauna survey for the Yugambeh Land Enterprises Limited (the owners of the Mt Barney Property) and Ronda attended the ceremonial handing over of the land to the Indigenous people. Local culture also of course includes the arts, farming and other pursuits by white settlers in the region. Ronda and Darren have both contributed to the Rathdowney Heritage Festival on a number of occasions, and Ronda was on the committee for a historical book produced during the Centenary of Australia's federation (2001). Araucaria also gave a donation towards the publication of a more recent, 2010 historical publication. We introduce our guests to relevant art exhibitions (especially those involving wildlife and nature generally) and to some of the local residents on our tours. During our tours we are careful not to disturb cattle or other domestic animals or to allow guests to enter private property without permission. Where such permission is granted we are careful to leave gates and other items as we find them. This principle appears to have arisen particularly in situations where operators from developed countries lead tours into developing countries, although democracy still sometimes needs its advocates in the former as well. Although Araucaria has not been directly involved in human rights issues, Ronda is a former member of the Guatemalan Human Rights Association (having visited Guatemala and stayed there with the sister of a refugee, at which time she was shown around some of the poverty areas by a local Indigenous man) and held meetings of Fiesta Hispanica at Griffith University, to spread the word about human rights issues in Latin America generally. She was especially interested in providing a forum for the Australian students to meet students from the various countries to emphasise that serious problems were happening to real people, including young people like themselves who they could talk, laugh and empathise with. She has also been a member of Amnesty International, and of AbSchol (a group at University of Adelaide for tutoring of Aboriginal students), and has participated in various human rights events in Brisbane (but avoiding some of the more extreme political movements). While not currently members of such groups the whole family retain an active interest in human rights throughout the world. When travelling internationally we try to get some feeling for life styles of various socio-economic groups and to support small local enterprises. We also attempt to bring in the Aboriginal and other minority points of view in discussions at meetings and conferences where these appear to be neglected. 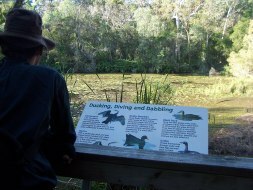 We are actively engaged in local conservation groups - which in addition to supporting the conservation of biodiversity includes helping other members of the community stand up for their right to live in an environment with unpolluted air, water and soil and enjoy the presence of native fauna and flora well into the future. We are members of Ecotourism Australia, Wildlife Tourism Australia (Ronda is vice-chair), and Wildlife Preservation Society of Queensland (Ronda is acting chair of the Scenic Rim group). Click here for other memberships by Araucaria and its staff.